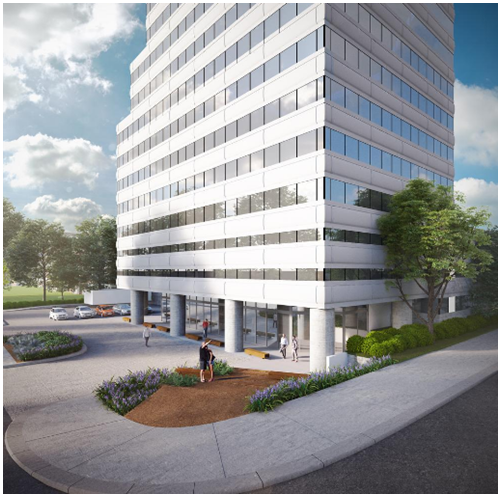 ​​​DALLAS – The 13-story, 112,225-sf boutique office tower at 3625 N. Hall St.—called Hall St. at The Centrum—will be transformed from the 35-year-old tower into a sought-after destination for modern office space. Plans include revamping the existing pull-in driveway into a usable plaza and garden, adding a Method Coffee shop with food options and showcasing an art collection, which is on loan from one of Quadrant's founders Howard Rachofsky. Along with renovations to the building, Quadrant's would-be tenants will also have access to the community spaces at The Centrum, which sits adjacent to the office tower. Those spaces include a rooftop deck, community courtyard, conference center, tenant lounge and a 6,000-sf fitness center. The renovations of Hall St. are slated for completion by August 2017.